​5 April – 1 September 2019. What kind of world will we be leaving behind? British-born photographer Nick Brandt has documented the changing environment and endangered animals in East Africa. The exhibition comprises Brandt’s impressive panoramic images. It has been the most popular exhibition to date at the Fotografiska, which has also produced the exhibition. What kind of world will we be leaving behind? British-born photographer Nick Brandt (b. 1964) has been documenting the changing environment and endangered animals in East Africa for nearly twenty years. The exhibition consists of 27 large, black and white panoramic photographs. 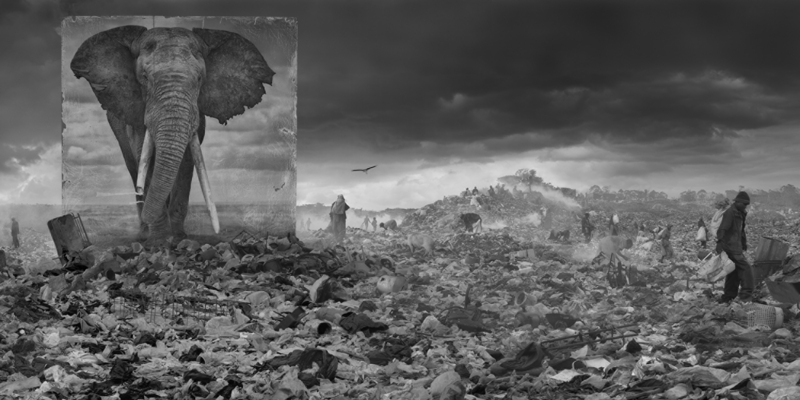 The impressive, life-size images of animals have been placed in habitats that have turned into factories, landfills and quarries. These are the areas where the animals used to roam. Humans have, however, utilised nature to such an extent that the habitats of both people and animals are endangered. Brandt is giving us pause to think about our inheritance and whether we are leaving behind only dust. The exhibition has been the most popular exhibition to date at the Fotografiska, which is the producer of the exhibition. The open guided tours are available to all, and they are included in the entrance fee. Book a private guided tour to the exhibition.